Prescription Alternatives is an easy-to-use, immediate reference for all the information you need about how medications affect your body, what you can do to counteract imbalances, and what alternative treatments work best. “FDA approved” doesn’t mean it’s safe! I love this book! It has vitamins and supplements to use for most any health problem you may have. This book tells the benefits and what to watch out for if taking medicines. Thanks for a very informative book on health problems and healthy solutions. This book gave me much insight on prescription medicines and its alternatives. If you want to live a much healthier life and longer life, then this book will be the first step. I share with everyone I care about who will listen. Now my voice can be heard worldwide! This was a small investment for a life change of knowledge for me. Very interesting and I have learned a lot. It is a book that everyone should read for the sake of their health. I haven’t quite finished it yet and am still learning facts that would be beneficial to all. Great book. It goes into great detail about the danger of combining prescription drugs and OTC products. Also, how certain medicines affect the liver….such as Tylenol. No home should be without this book. I have had some problems with prescriptions for diabetes. I am reading and researching everything everything in order to stay healthy–sometimes on my own. It means not taking some of the stuff the Dr. prescribes, but I do let him know when I refuse, and when and what I substitute. This book helped. Information that safely improve your health. Very practical & useful book. 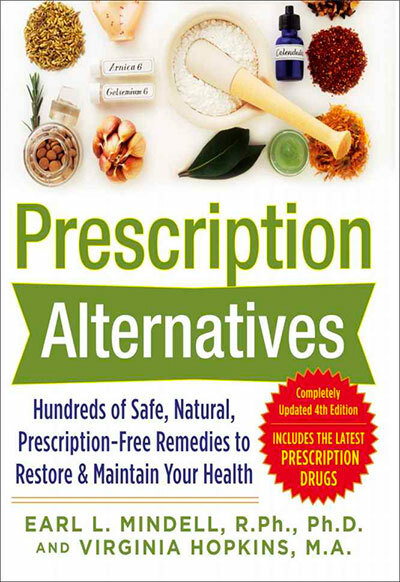 Anyone who is concerned about the relative risks and benefits of traditional Rx medications vs.safer natural alternatives such as supplements / vitamins & minerals, food, exercise, and so forth, should consider adding this book to their personal library. I know more than the average person about such topics and use many of the recommendations, but I still have pored over certain sections extensively. Copyright Earl Mindell · All Rights Reserved.